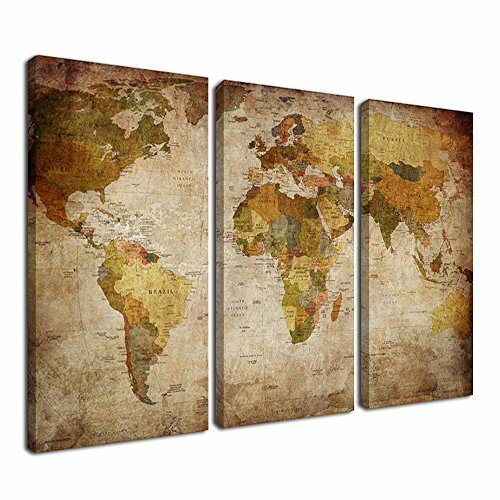 High Definition Canvas World Map Wall Art Painting Framed Ready to Hang for Wall Decor. *HD picture prints on thick canvas with vivid color, waterproof, non-fading, dust proof features. *Each canvas panels already framed and stretched over solid pine wood bar with hook accessories nailed, easy to hang. *Each panels edges of paintings are also printed to make it get perfect 3D effect, perfect wall decoration for home and office to make you feel relax while working or get off work. Ardemy Art are art creator and manufacture over 10 years experience for 100% hand painted oil paintings and canvas prints artwork. We are professional online supplier for modern canvas wall art, handmade oil paintings, acrylic paintings, watercolor paintings, abstract art paintings. We guarantee 30 days money back and make you rest assure to purchase our products with high quality and affordable price. Perfect choice for bedroom, living room, guest room, meeting room, bathroom, dinning room, coffee bar, nurseries house, hallway, corridor, college dormitory, hotel, inn, spa, lounge, salon, home and office decor. Best choice gift idea for holiday, wedding, Christmas, Valentine's Day, Anniversary, Father's Day, Mother's Day, Birthday. The painting displayed in the pictures above provides an idea of how this canvas art printing looks like on your wall. It does not represent the exact size of the printing. Please measure your wall before you choose the ideal size. Due to the different brands of monitor setting, the printing colors may appear slightly different. If you have any questions, please contact us directly. We will try our best to help you within 12 hours, hope you have a enjoy shopping experience in our store. Wall Art Decor Size: 16inx32inx3pcs (40x80cmx3pcs), overall size 48"length x 32"width x1" deep stretched bar. Our Brand is Ardemy, registered serial number '87283505' , this is our only authorized shop. Guarantee: Canvas prints are packed in carton box, 100% satisfied 30 days refund gurantee without any reasons. Rest assured to buy! If you have any questions about this product by Ardemy, contact us by completing and submitting the form below. If you are looking for a specif part number, please include it with your message.